I’ve never thought I would actually got my hands on some leopard ankle boots. Anything leopard reminds of what Grandma Yetta would be wearing (Well, that’s actually how I see myself in 50 years). But I thought I would give it a try, I just love how fun they are! For this outfit, since the shoes are quite a big statement, I went for a simple Fall color palette. I also wanted to add a little edgy vibe for a change. Hence why, I thought that pairing these shoes with a moto jacket would be a good bet. I kept it simple for the rest of the outfit: a simple top from Loavies and my favorite mom jeans ever. Finally, the belt adds some more detailing to the outfit. Love this neutral simple look! 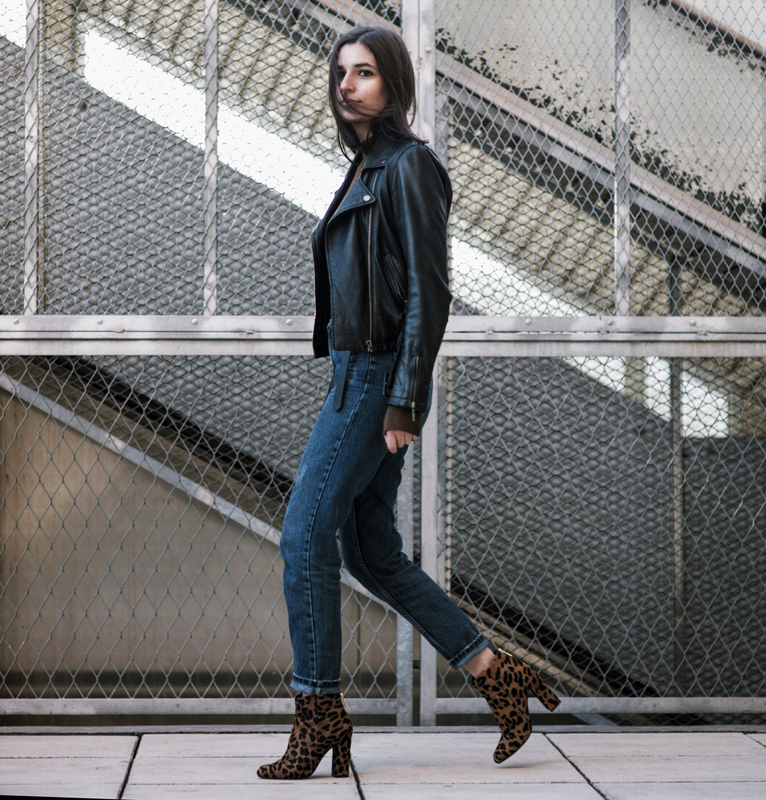 The leopard booties definitely add an unexpected glam but not in a matronly way like you were concerned about. You look gorgeous! I have such a big crush on these boots, I genuinely love them ! Your outfit is perfect, i particularly love the side knot that you did on your belt. Oh my God. Those boots are the cutest. Looking lovely. Fab look. Love the leopard boots and the way you’ve matched the brown top to it. I really like this hip look! Your leo boots are gorgeous and fit your knit perfectly! You always look so stylish.. So gorgeous! 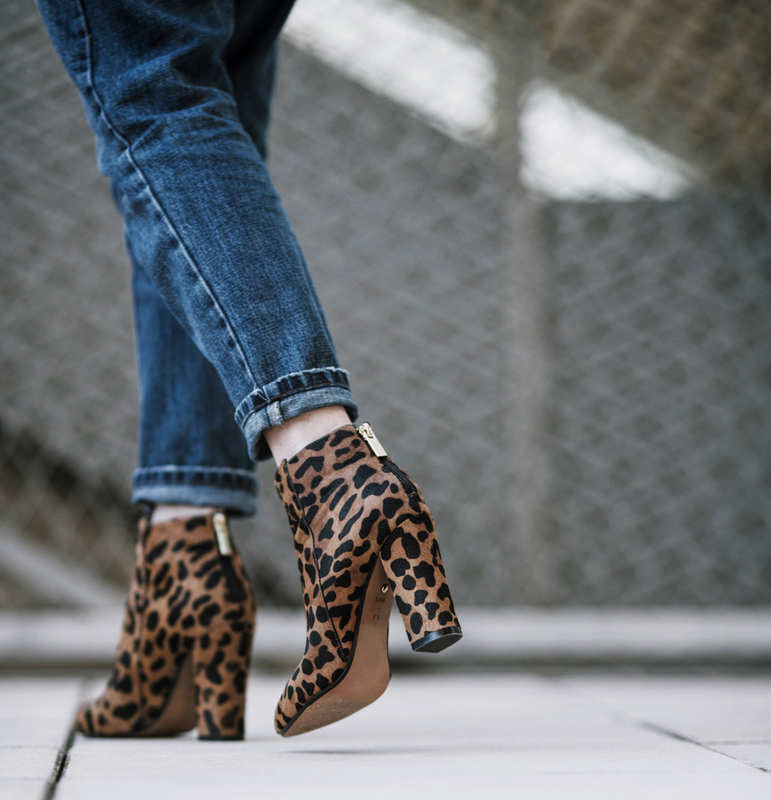 Love your leopard print boots! This whole outfit is perfection, Aria! I love the way you combined those leopard boots with those jeans, so so perfect! I love it!! relaxed, polished and the boots!! I’m dying!! J’adore ce pull trop jolie!